As part of Western Sydney University's Research Week, the Institute for Culture and Society will host a thinking-in-common session exploring the concept of resilience. In this thinking-in common session we explore the concept of resilience. Resilience is a term with a long history and diffuse origins. Arising in engineering, ecology, and psychology in the 1970s, resilience is generally defined as the capacity for materials, ecosystems or individuals to persist in the face of stress. More recently this term has come to circulate across numerous disciplines from economics to health to considerations of infrastructure. As the concept has spread it has moved from being a suite of measurable properties to a politically potent metaphor and, increasingly, a political objective in many policies and programs. As appeals to ‘become resilient’ or ‘build resilience’ proliferate it is an open question as to whether or not the term has reached its ‘use by date’. Could resilience be following in the footsteps of other terms like sustainability to diversity by becoming increasingly empty and vacuous? Or does it still have political traction and policy potential as a rallying term for new approaches to pressing contemporary concerns? Can appeals to resilience become a sort of shorthand for celebrating individuals’ and communities’ capacity to adapt to rapid change—from digital disruption to extreme weather to rising inequality and precarity? And what is the effect of these celebrations of resilience – do they distract from the impacts of ecological, economic, political and cultural change or foreground them? This panel explores how the concept of resilience and its complex uses and effects might be recovered. Can resilience provide a way of describing other and better economies, politics, cities and forms of caring for people and places in these dark times? Resilience has an increasingly jaded reputation. This paper will focus on interpretations of resilience based in ecology and complex adaptive systems, arguing that adaptive comanagement and commoning offer pertinent and defensible models for governing resilient systems. The paper will draw research into housing as informed by this framework to argue there remains potential for resilience as an enabling concept. Dr Louise Crabtree is a Senior Research Fellow and Director of Engagement at the Institute for Culture and Society. Her research includes housing, sustainability, and governance. Does resilience offer a hopeful politics for addressing mental health issues or does it perpetuate ‘cruel optimism’ (Lauren Berlant) through a preoccupation with restoring a humanist self? With respect to gendered patterns of depression, resilience thinking urges individual women to adapt to cultural life where inequities and affective relations enable distress to flourish. Alternatively, material feminism offers to reorient our thinking through a relational understanding of recovery-transformation as an ongoing material, affective and discursive entanglement. Professor Simone Fullagar is an interdisciplinary sociologist and Professor, Physical Culture, Sport and Health at the University of Bath, UK. Her research explores the embodied politics of gender, physical cultures, health and wellbeing through material feminist and post-structuralist perspectives. She is writing a new book - A Vital Politics of Depression and Recovery. Can the concept of resilience be redeemed? Organisations committed to practices of careful cooperation allows for an affirmative response and a different understanding. NORCO is a 125-year-old dairy cooperative in Lismore, NSW. In the past twenty years it has used the principles of cooperation to improve its position in the context of a volatile economy and ecology. Key to success are 'Care-full' relations with members, employees in three manufacturing plants, and the greater community. Dr Stephen Healy is a Senior Research Fellow at the Institute for Culture and society and a founding member of the Community Economy Research Network. ‘Resilience’ has become all the rage in describing cities and communities. Organizations such as the Rockefeller Foundation set out in good faith to contribute to a positive theme concern urban practice. Unfortunately, the term has become one-dimensional and reductive. It is now too often associated with the comfortable deferral of state and corporate responsibility for supporting recovery from difficulty and disaster. Instead of positive resilience, we now increasing defer to the capacity of those suffering to find it in themselves to recover. Professor Paul James is an editor of Arena Journal and author or editor of 34 books including Nation Formation (Sage) and Globalism, Nationalism, Tribalism (Sage). 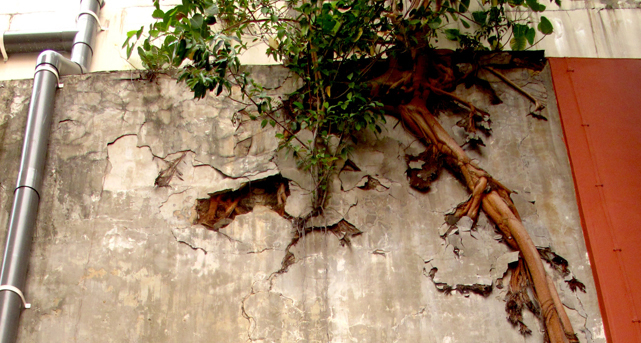 Image: The roots of a plant grow out from a block of concrete in a laneway in Singapore. By ICS graduate Dr Andrea Del Bono.